Even if your home is bedecked with hardwood flooring, chances are that you have a number of area rugs. They can add softness, warmth, and a subtle splash of colour that can effortlessly lift a room and create that wow factor. That said cleaning them can often be more challenging that standard wall-to-wall carpet, especially when (in the case of oriental style rugs) they’re of much finer quality. With this in mind, just how do you go about preserving your rug? Here are some simple tips you might want to adopt. Shoes can bring in vast quantities of dirt and debris which can all be deposited straight onto your area rug. When further walked on, this existing dirt, dust, and debris, is ground down which in turn can break down the fibres of your rug. By adopting a ‘no shoes’ policy, you can alleviate this problem right away. Because fine area rugs are considered more delicate than most wall-to-wall carpets continual vacuuming can accelerate their deterioration. Yes they need to be vacuumed to prevent any debris from getting into the carpet fibres, but consider doing it as and when you see specks of dirt, rather than on a ‘just in case’ basis. Strong chemical cleaning agents can play havoc with the fibres of your fragile rug so consider natural alternatives instead. Try using baking soda and vinegar for example to remove light stains, or soda water and dishwasher detergent to remove any oil based stains. Apply sparsely and blot dry to remove the stain. Whatever you do don’t scrub. In order to keep your area rugs in pristine condition you should look to a professional carpet cleaning company who specialises in fine rugs. They will have the relevant experience to know exactly how to handle your rug so that it doesn’t shrink, fade, or colour-run. Also by having it done once a year, you are in effect preserving the life of your rug. 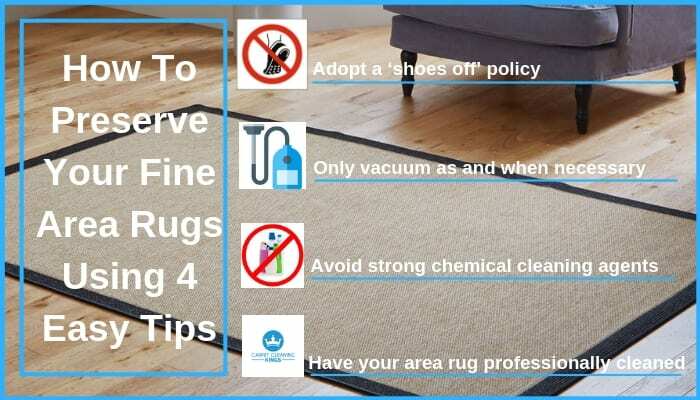 A word of warning – Unless you know what you’re doing, don’t try and steam clean your rug yourself as you could end up running into all sorts of problems, or even ruining your prized carpets once and for all. Instead leave it to the pros. If your area rugs have cost you good money, you’ll want to keep them looking pristine for as long as possible. By following the tips above you’ll continue to have good looking rugs that complement your home for many years to come. For further advice or to contact us for a cleaning quote, contact Carpet Cleaning Kings on 1300 7000 75. Why not put us to the test and see for yourself?